I recently spoke with Bill Kunkel, the Co-founder of videogame journalism, and Executive Editor for Electronic Games Magazine during the 80's, and uncovered the revealation that there was actually a different cover intended for their first issue. Here is the story from Bill Kunkel himself, followed by the showcase of the original cover seen for the first time since 1981, almost two decades ago! Bill Kunkel, "There are a lot of stories behind the various Electronic Games Magazine cover design meetings and occassional photo shoots. We always devoted a lot of thought and effort to make those things work. 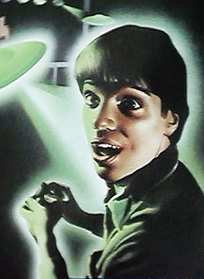 I had the idea for the very first cover -- the kid being "zapped" by the saucer from a Space Invaders type game which has departed his TV screen and entered 3D space. The original drawing, however, was not universally popular -- the kid had that "I'm getting zapped" look all right, but it wasn't a a good kind of zapping. So it was re-drawn, but I had to go to the summer CES in Chicago in June '81 armed with nothing but the promise of a game magazine and these original cover slicks with the kid looking very weird and the ad info etc. printed on the back. Obviously, our history with Video Magazine was a help, and there weren't many companies to meet with, so I could take my time building personal relationships at each company. Obviously, the game publishers thought it would be great -- if it sold. But other folks, like Jim Levy at Activision, had already "gotten" it and the PR person Diane Drosnes was already treating me like visiting royalty. Magnovox genuinely liked us which meant Atari had to play. After that, everybody wanted in. Or ALMOST everybody. At the time, for example, coin-op companies produced these gorgeous, lavish ads for only two magazines -- RePlay and Play Meter -- both of which were trade publications. They simply did not advertise to the general public. So I suggested that we give Midway, then the top company in the business, our back cover -- for free. Midway took a week or two to take us seriously, but they loved the ad placement and wound up as regular advertisers through most of the magazine's run." the original cover artwork for the premiere issue of Electronic Games Magazine! Switch On! by Frank Laney Jr.
Did you know that you're a member of the world's fastest-growing hobby group? It's true. Although the first Pong machine made its debut only a decade ago, today more than five million Americans regularly play electronic games. ¤ Nearly four million homes now have programmable videogame systems. ¤ This year alone, Americans will buy two million videogame systems--and 20 million cartridges to use with them. ¤ Gamers pour 10 million quarters into Asteroids coin-operated machines every single day. And now the hobby is reaching another milestone. At last there's a high-quality newsstand publication that we arcaders can really call out own. Reese Publishing Co., prompted by your overwhelming support of the "Arcade Alley" column in Video, is giving all lovers of electronic games a rallying point. What kind of magazine will Electronic Games be? For openers, this publication is written by actual gamers for actual gamers. You'll never see so-called "reviews" written directly by manufacturers' press releases by know-nothing writers in these pages. That's a promise. Everyone on our staff, from co-founder and executive editor Bill Kunkel to staffers like Frank Tetro and Joyce Worley, are nuts about these games. In this and upcoming issues, we'll be covering every facet of the fast-changing world of electronic gaming. We'll cover the entire spectrum of this fascinating hobby from the tiniest hand-helds to the most sophisticated computer simulations, with plenty of emphasis on videogames and commercial arcades. Exactly how much space we devote to each aspect of electronic gaming depends on you, the readers. Please take a few minutes to fill out and mail the readers poll located elsewhere in this issue. It'll do a lot to help us create exactly the type of magazine you want. Why not drop us a line? 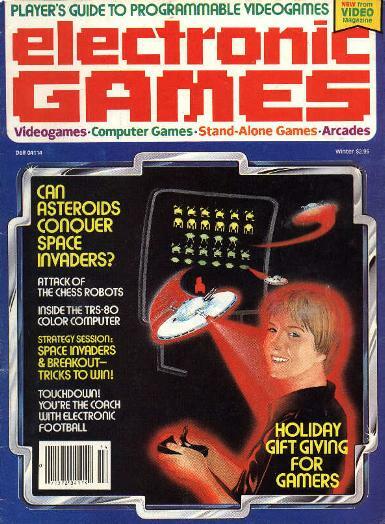 Tell us what you liked--and what you didn't--about this premiere issue of Electronic Games. And feel free to comment on any of the ideas and opinions aired by our writers. One final promise: This installment of "Switch On!" will probably be the most sober-sided piece you'll ever read in this magazine. We try to take electronic gaming seriously, but not, we hope, solemnly. After all, fun is what this hobby--and Electronic Games--is supposed to be about. We want this magazine to be as colorful and exciting as the games themselves. When Frank Laney Jr and Bill Kunkel first proposed an electronic games column for Video magazine, it sounded like an interesting idea. We weren't sure our readers had enough interest in this new "sport" to justify such a column, but we decided we had nothing to lose by trying it out. Not only did Video not lose anything by inaugerating the now-popular "Arcade Alley," but we've gained a whole new magazine, Electronic Games. 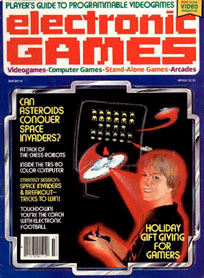 Cast in the same mold as Video--the leading home video periodical--EG is written by the field's top authorities and edited to appeal to the growing legion of arcade addicts. Both Bill and Frank are expert gamers who, through "Arcade Alley" and direct consultation with game designers, have contributed notably to popularizing and refining the noble art of electronic gamesmanship. They originated the Video magazine "Arcade Awards" (Arkies) to honor excellence in electronic gaming, and they are recognized by manufacturers and players alike as the top commentators on America's fastest-growing home entetainment hobby. With so many half-baked electronic entetainment magazines floating around these days, we feel it is important to assure you that Electronic Games will maintain the same editorial integrity and excellence readers have come to expect from Video Magazine. Our primary goal, as it has always been with Video Magazine, is to remain responsible and responsive to our readers. I was just looking over the great page Michael has posted which shows off the famous "lost" cover for Electronic Games' first issue back in the Winter of '81-'82. What I hadn't noticed previously, however, was the interesting reprints of the introductory editorials from that first issue and the fact that any classic gamer worth their salt knows that it was Arnie Katz and I (along with Joyce Worley) who created that magazine. So why is the editorial being written by "Frank Laney Jr.", you may ask? Go ahead, ask. The deal is as follows: that first issue of EG was produced as a freelance venture, with no guarantee that there would be any subsequent issues. Now, I was working as a freelance writer for Harvey Comics at the time as the primary scripter for the numerous Richie Rich comics, so nobody cared if I was writing for some goofy videogame magazine. Arnie, on the other hand, was an established editor for a major trade publisher, and if anyone at his company saw his name as editor of a game magazine, it would have cost him his job. Soooo, for that first issue (which is now so valued as a collectible that I can't afford to buy a copy), Arnie used the name "Frank Laney Jr" as a beard. He chose that name to honor Frank Laney, a famous science fiction fanzine editor and writer from the '40s and '50s and author of the seminal "Ah, Sweet Idiocy! ", a cynical, caustic and very funny look at the LA fan scene in the post-WWII era. Mysteries, it appears, invoke more mysteries. So now you know.